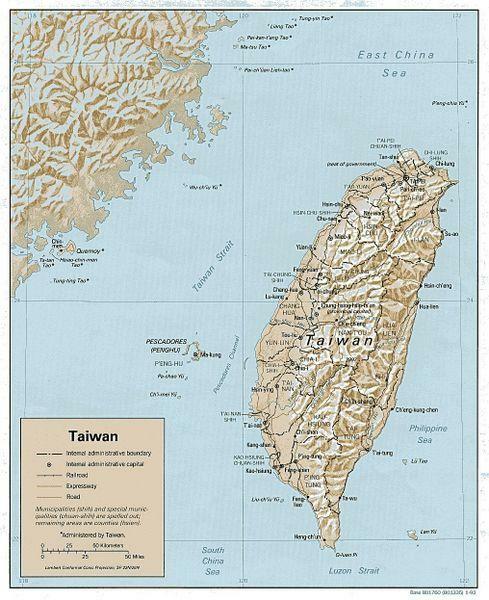 Taiwan is an island in East Asia. "Taiwan" is also commonly used to refer to the territories administered by the Republic of China (ROC) and to ROC itself, which governs the island of Taiwan, Lanyu (Orchid Island) and Green Island in the Pacific off the Taiwan coast, the Pescadores in the Taiwan Strait, and Kinmen and the Matsu Islands off the coast of mainland Fujian. 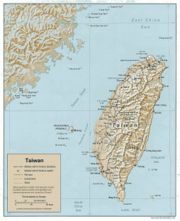 The island groups of Taiwan and Penghu (except the municipalities of Taipei and Kaohsiung) are officially administered as Taiwan Province of the Republic of China. However, in practice, almost all government power is exercised at the national and local (city/county) levels. The main island of Taiwan, also known as Formosa (from Portuguese (Ilha) Formosa, meaning "beautiful (island)"), is located in East Asia off the coast of mainland China, southwest of the main islands of Japan but directly west of the end of Japan's Ryukyu Islands, and north-northwest of the Philippines. It is bound to the east by the Pacific Ocean, to the south by the South China Sea and the Luzon Strait, to the west by the Taiwan Strait and to the north by the East China Sea. The island is 394 kilometres (245 miles) long and 144 kilometres (89 miles) wide and consists of steep mountains covered by tropical and subtropical vegetation. This page was retrieved and condensed from (http://en.wikipedia.org/wiki/Taiwan) see Wikipedia, the free encyclopedia, March 2008. This information was correct in March 2008. E. & O.E. 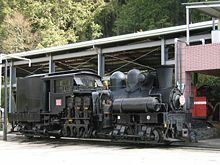 The Alishan Forest Railway is an 86 km network of narrow gauge (2 ft 6 in (762 mm)) railways running up to and throughout the popular mountain resort of Alishan in Chiayi County, Taiwan. The narrow gauge lines were originally constructed by the Japanese Colonial Government in 1912 to facilitate the logging of cypress and Taiwania wood, however today the line caters mostly to tourists. Passenger carriages were first added to the trains in 1918. 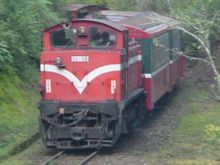 Unlike the national rail system administered by the Taiwan Railway Administration, the Alishan railway is managed by the Forestry Bureau. The system is currently operated using diesel locomotives, although there are occasional special public runs using the old steam powered Shay locomotives. Taiwan's government has listed the forest railway as a potential World Heritage Site. However, Taiwan's exclusion from the United Nations means it is unlikely to be formally recognized as a WHS in the near future. The main line runs from the city of Chiayi (elevation 30 m), to the final station of Alishan (elevation 2216 m). The vegetation along the way changes from tropical to temperate and finally alpine. The line features many switchbacks on the way up the mountain. Includes several steep gradients (max. 6.26%), a spiral and four switchbacks; longest line with most dramatic climate change. Early morning trains, popular for viewing the sunrise over Jade Mountain. Closed due to earthquake damage. This page was retrieved and condensed from (http://en.wikipedia.org/wiki/Alishan_Forest_Railway) see Wikipedia, the free encyclopedia, March 2008. 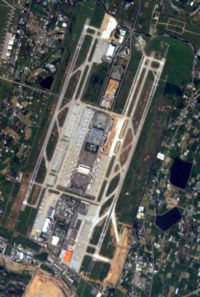 Taiwan Taoyuan International Airport, formerly Chiang Kai-shek International Airport, also known simply as Taoyuan Airport or C.K.S. Airport, is an international airport located in Taoyuan County, Taiwan. It is one of three Taiwanese airports with regular international flights, and is by far the busiest international air entry point amongst them. It is the home base for China Airlines and EVA Air, which both operate a major hub at this airport. Taiwan Taoyuan International Airport is one of the two airports that serve northern Taiwan, including Taipei. The other is Taipei Songshan Airport located within the Taipei City limits, which serves only domestic flights and rarely, some special international mission flights for the President and Vice President of the Republic of China as well as other international sovereignties' chartered flights. Taipei Songshan Airport formerly served Taipei as its international airport before the opening of Taiwan Taoyuan International Airport, then known as Chiang Kai-shek International Airport, in 1979. The other two airports with regular international flights in Taiwan are Kaohsiung International Airport (Hsiaogang Airport) and Taichung International Airport, while Hualien Airport and Makung Airport are allowed and occasionally offer international charters. 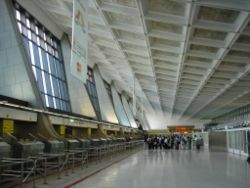 The airport, planned as the Taoyuan International Airport, bore the name of late President of the Republic of China Chiang Kai-shek until 2006. In Chinese its former name was Chung-Cheng (Zhongzheng), the style name that Chiang Kai-shek chose for himself during his political career. The title is rendered without his family name, a traditional gesture of respect. In a situation roughly analogous to those affecting Ronald Reagan-Washington National Airport and, for many years, Cape Kennedy in the US, political associations connected with the name led some people to avoid using it. In Taiwan Chiang Kai-shek is associated with the Chinese Nationalist Party or Kuomintang and its many years of one-party authoritarian rule. 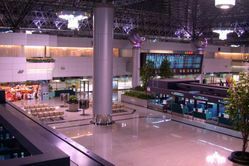 Local officials in Taoyuan County and members of the pan-Green coalition often referred to the hub by the name originally associated with it, "Taoyuan International Airport." News organizations and local residents sometimes combined the two commonly used names as "Taoyuan Chung-Cheng Airport." The airport opened (with Terminal 1) on February 21, 1979 as part of the Ten Major Construction Projects pursued by the government in the 1970s. This page was retrieved and condensed from (http://en.wikipedia.org/wiki/Taipei_Airport) see Wikipedia, the free encyclopedia, March 2008.